The new Barracuda XT hard drive from Seagate offers customers a compelling new storage choice for high-capacity, high-performance computing solutions. 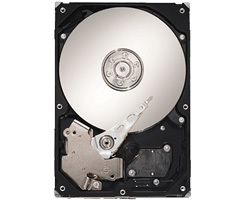 Unlike other available 3-TB solutions that run at 5400- or 5900-RPM speeds, the new Barracuda XT drive is built on a full-speed, 7200-RPM, 4-disk platform. Further turbocharged with a huge 64-MB cache and the industry's new, high-performance SATA 6Gb/s interface, the Barracuda XT drive is destined to set a new standard for high-speed desktop performance. High-definition content is driving the need for space and speed. Whether on the Internet, in a theater or erupting from a high-powered PC gaming rig, content is getting richer and proliferating around the world. The professionals who develop and produce this content and the consumers who enjoy it find themselves in need of more powerful computing systems to process and store this data. No longer do power users need to compromise when it comes to choosing capacity or speed; the Barracuda XT drive has it all! Discerning high-performance PC users, multimedia development professionals and power users in general will appreciate the capacity, performanceand flexibility the Barracuda XT drive offers. 70 percent or more of the materials used in the manufacture of Barracuda XT drives are recyclable. Up to 50 percent of the materials used in the manufacture of Barracuda XT drives come from recycled sources. OWC Tech Support Note: SEAST33000651AS is not compatible with G5 computers (doesn't automatically clock to SATA I). The only way to change this is with SeaTools (Seagate's proprietary software) which is Windows only downloadable from Seagate's website. A massive 3-TB drive capacity provides plenty of room for downloading today's space-hungry PC games or up to 45 hours of 1080i, HD-DVCPRO-encoded, high-definition video. The SATA 6Gb/s interface enables the use of the industry's newest and fastest hard drive controllers while providing backward compatibility to legacy SATA 1.5Gb/s or 3Gb/s systems. Configurable with Seagate® SeaTools™ software-Users can optimize the drive configuration and tune for capacity or performance for the ultimate in customer choice and control.